Birch trees (Betulaceae) grow naturally in areas along riverbanks and streams, as well as moist soils near pastures and disturbed areas of land. Birch trees reach a mature height around 50 feet tall and 50 feet wide. 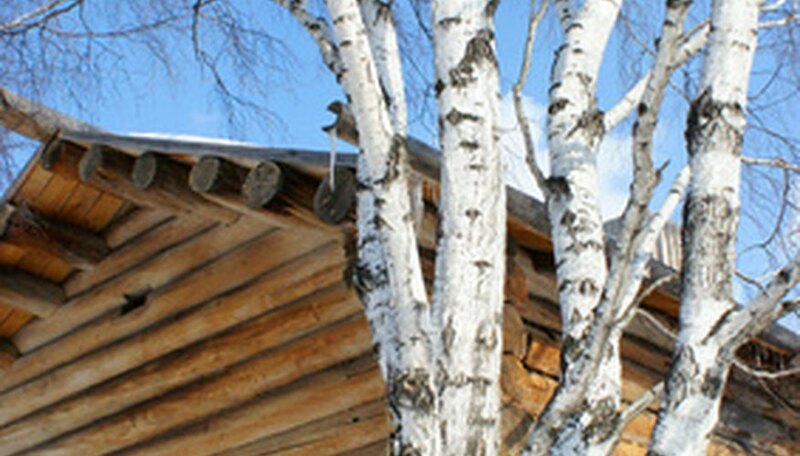 Many varieties of birch trees provide interest in the landscape with their unusual, peeling bark in shades of gray, tan and white. Like many other types of trees, birch trees occasionally require relocation from one area of the landscape to another. Select the new location for your birch tree before digging it out of the soil. Choose an area that receives plenty of daytime sunlight. Locate your tree out of the way of utility lines and permanent structures. Avoid planting these in areas where their mature growth will cast shade over other plants that require full sunlight. Test the soil in your selected site to find out whether you need to amend it before transplanting your birch tree. These trees thrive in slightly acidic soils, with a pH level below 6.5. Add organic ingredients, such as raked leaves and aged manure, to lower the pH level and increase the amount of nutrients in your soil. Loosen the top 12 to 18 inches of soil in your site and mix in compost to form a loose, well-drained planting medium. Dig your river birch out of its current location with a shovel. Include as much of the roots as possible, digging a circumference equal in size to your birch’s overhead canopy of branches. Carefully remove the entire rootball from the soil by placing your shovel under the loosened rootball and prying upward. Grasp the bottom of the rootball and lift it onto your piece of burlap fabric. Pull the edges of the burlap over the roots and secure with a piece of rope. Move your birch tree near your new location. Gently dampen the piece of burlap with water to keep it moist while you prepare the hole. Dig the hole about twice as wide as your birch’s root system and about the same depth as the roots. Remove your tree from the damp burlap and place in the center of your hole. Hold the tree upright while filling in the sides with your soil. Firmly pack the soil around the rootball with your feet. Water your transplanted birch tree immediately after planting. Thoroughly soak the soil to the depth of the roots. Add soil if the water causes a depression around the base of your tree. Keep the level of the soil over the roots of your birch tree level with the nearby surface.